AMD Piledriver just 10 percent faster than Bulldozer? 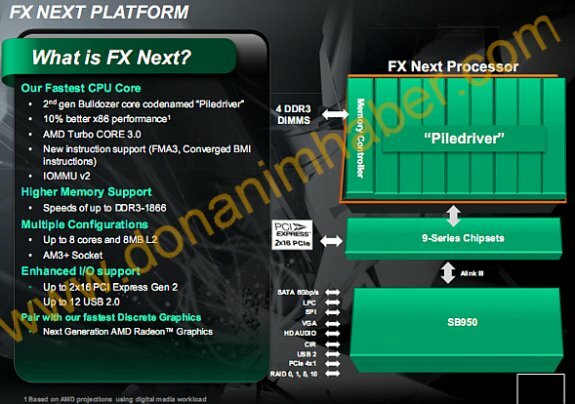 A leaked slide claimed to originate from AMD claims Bulldozer will be succeeded by Piledriver. Dubbed FX Next, this next-gen chip is claimed to offer a 10 percent increase in x86 performance compared to Bulldozer. What's new in Piledriver? According to the slide, a 10% increase in x86 performance. Version 3.0 of Turbo Core is also on the menu, as are a couple of new instructions. FX Next will reportedly use the same AM3+ socket as the first wave of Bulldozer CPUs, so you should be able to pop it into existing motherboards. The AMD slide suggests that FX Next will use the same 9-series chipsets that have been around since May. Those chipsets are actually just rebranded versions of AMD's old 8-series gear, which has been gracing motherboards for a year and a half now. That means no native USB 3.0 support and a slower 6Gbps SATA controller than competing Intel platforms. The 990FX does offer gobs of PCI Express 2.0 connectivity, but that's gonna look dated if PCIe 3.0 hardware starts popping up next year.